Arriving fifteen minutes before curtain at the unusual location (the Centre for Digital Media, in an amorphous space dubbed “the Hangar”), all the seats are taken and only mattresses placed on the floor remain. I’m looking forward to an adventure, and I’m happy to recline for the length of the play, but my companion is completely turned off. He suspects the mattresses are from someone’s basement, and have stains he can’t quite see in the pre-show gloom. His images worsen as we wait for the play to start, and he describes the mattresses as the sordid bedding rapists would have in their rooms. Images of hell, for sure, but somehow a distraction from my anticipation of the evening. I’ve brought him because he hates theatre, and I’m hoping to change his mind with a kind of theatre he’s never seen before. Unfamiliar with the work of The Virtual Stage, I do know what Electric Company shows are usually like, so despite his fears I settle into the mattress still hopeful that theatre will be triumphant tonight. There are numerous artistic companies in town right now who are trying to integrate live performing arts and video, and No Exit is a chance to think about how well these two artistic forms really do work together. 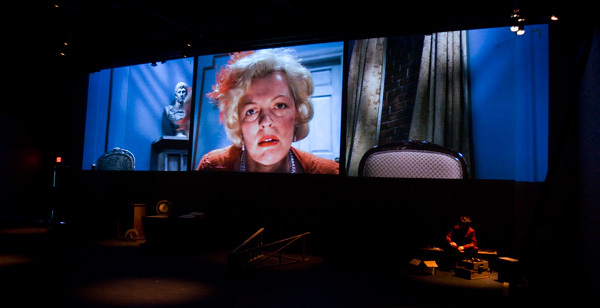 Some of the Vancouver productions who have made the attempt weren’t able to solve the basic problem at the root of attempted integration: live performances take place in three dimensions, while film or projections take place in only two, although the illusion of three may be created. This fundamental difference meant that projected images inspired by Roy Kiyooka’s artwork never really merged aesthetically with live musicians performing Vancouver New Music’s Marginalia (Feb/08). Even the screen at the back of Boca del Lupo’s stage for My Dad My Dog (Jan/08), which featured the most delightful animation, sometimes sucked the life out of the actors and the performance space in front of it. Done poorly, the merger of two- and three-dimensional art forms highlights the differences between the forms, and in a way that casts each in a weaker light. Live performances become less vital than they can be, and film seems less visually interesting. In the past, the Electric Company has actually produced some of the most successful attempts at integration. In Studies in Motion: The Hauntings of Eadweard Muybridge (Jan/06) digital projections enriched the playing space, which never lost its supremacy or its sense of depth. As the play was about a film pioneer, who tried to capture movement through stop-motion photography, the company’s merger of live action and digital imagery advanced not only the aesthetic of the play, but also its meaning. More recently, in Palace Grand at this year’s PuSh Festival, the company used projections on a screen placed in front of the stage to highlight both the play’s set (a theatre within a theatre), and a period (a time when vaudeville was about to give way to cinema, even in the wildest reaches of our country). In both cases, the use of the technology didn’t just look good. Technology also served the setting and the plot; a merger of form and function. Unfortunately, No Exit never achieved the same kind of merger for me, and the co-production’s alluring idea never led to full seduction by evening’s end. the very three in which we are living right now. It also demands risk and courage from actors who must communicate to us directly, and who can create illusions only with our willing participation. In director Kim Collier’s production, the live actors are in a separate room. We assume they’re acting in real time for us, but as we watch the screens showing their far-larger-than-life-sized images, it becomes irrelevant that they’re in the building. They don’t have to be. The screens could just as easily be showing us yesterday’s performance, or last year’s – it would have the same, muted effect. To replace the immediacy lost in the main characters’ performances, the minor character of the Valet (Jonathon Young) remains on stage under our direct gaze, occupied in various meandering bits of business that can’t carry an evening-length play. The attempt to insert a bit of philosophy by way of flash cards held up to the audience is not enough to justify his existence onstage, in place of the action that was actually written to happen there. As the live action falls a bit flat despite its strong performances, so does the digital imagery. In order to film the main characters with multiple, hidden cameras set around the same room, the room itself had to be kept fairly bare so that each camera had an unobstructed view, presumably. This design is roughly in keeping with Sartre’s original script. However, a bare set diminishes the capability of film to create the illusion of depth through manipulation of foreground and background. In this room, any foreground could block the view of another camera. That leaves the audience with mostly the plain, unadulterated subject on camera. The few moments when depth becomes exaggerated – a woman’s hands held close to the lens, past which we can see an actor’s face in the background, for example – seem inadequate because they aren’t part of a larger attempt to create more complex, structured images. My experience of its current realization was that No Exit weakened the most vital elements of live theatre, and replaced them with the least vital elements of digital film. I am sure this was not the intent. Perhaps No Exit, with all its alluring promise, was simply still a work in progress. If so, we may need to promote works like these as a separate theatre-going experience, at which audiences are welcome partners in the development of new works, and not invited to receive a promising idea as a finished work. Then maybe I can bring my friend back from the dark side. The Virtual Stage and The Electric Company: No Exit by Jean-Paul Sartre. Director Kim Collier. Text by Jean-Paul Sartre. Performers Lucia Frangione, Laara Sadiq, Andy Thompson, Jonathon Young. Video Designer and Co-Producer Andy Thompson. Lighting Designer John Webber. Set Designer Jay Gower Taylor. Editor Bojan Bodruzic. Costume Designer Kirsten McGhie. Sound Designer Brian Linds. The Centre for Digital Media, May 1-10 2008.